It seems that too often talk about China development focuses on ‘hard’ infrastructure projects including roads, bridges, power stations, rail systems, etc. Yet what is often overlooked in discussions about China’s infrastructure are projects designed to enhance quality of life for city dwellers. I recently discovered one of these new projects in the city where I live, Chengdu. For months leading up to summer, large portions of the promenade along the Jinjiang River, which runs through the middle of the city, was walled off while new landscape construction took place. Upon completion, the riverside opened up with sleek modern guard rails and wide lanes with brand new pavers and newly planted trees. As soon as the promenade opened again, I resumed my usual jogging route which runs from the city center to about 5 km south along the river. Besides having a smooth new surface to run on, I also found that when I reached the fenced off area where I usually turn around and head back, the fence was gone. Curious to explore further, I carried on along the river. I ran through some formerly industrial areas and eventually ended up in Chengdu’s suburban periphery outside of the south section of the 3rd Ring Road where new residential towers sprouted up from the ground among vast swaths of green space. The path continued on along the river but at that point I thought it best to turn around before sunset. It turns out that the extended path is part of Chengdu’s ambitious plan to add 800 km of recreational path by next year. Keeping in line with its self-proclaimed status as a ‘Modern Garden City’, the city is actively promoting green space that enhances quality of life. 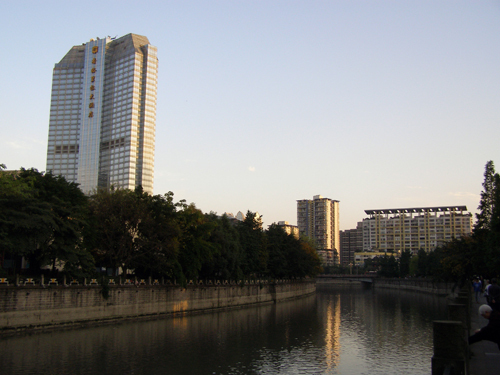 Given that Chengdu has a temperate climate, a system of recreational paths linking the city center with its surrounding suburbs is a worthwhile investment.